This volume offers extensive information on preventive and infection surveillance procedures, routines and policies adapted to the optimal infection control level needed to tackle today?s microbes in hospital practice. 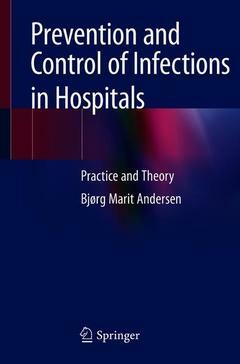 It especially focuses on preventive measures for serious hospital infections. Each chapter includes a practical section that addresses the main aspects of procedures and treatment, and a theoretical section that contains updated documentation that can be used for further study, or to help select infection control measures. o HCW with infections/carrier state. • Care of patients; patient hygiene, mouth hygiene, treatment of wounds etc . • Protection against airborne infections; ventilator equipments: use, cleaning and disinfection; ventilator associated pneumonia (VAP) etc. • Operation department- prevention of infections. Bjørg Marit Andersen is Doctor in Medicine, Specialist in Medical Microbiology, Professor in Infection Control and Hygiene, and former head of Department of Hospital Infections, Oslo University Hospital - Ullevål, with regional infection control responsibilities for Health Region East, and later the South-Eastern part of Norway. She is a lecturer in infection control, hygiene and medical microbiology for healthcare personnel at several universities and high schools in Norway. She has also been a lecturer in infectious diseases at Ullevål University Hospital, head of microbiological department at the University Hospital of North Norway in Tromsø and special adviser in communicable disease control for Army Medical. Bjørg Marit Andersen was a guest researcher at the Centers for Disease Control and Prevention; CDC, in Atlanta, USA, and has also studied infection control at hospitals in the US by the Minnesota Department of Health. For several years she has been a member of SHEA Guidelines Committee working with supervisors regarding infection control. She has more than 350 publications within the field of medical microbiology/infectious diseases/hospital infection control, including more than 100 original works. In addition, she wrote several review articles, abstracts, books, and Handbooks in: Medical microbiology (last one in 2014), Infection control in LTCF (last one in 2013), and Infection Control in Hospitals (Norwegian edition in 2016). Bjørg Marit Andersen received the Norwegian Medical Society’ quality price in 2001.